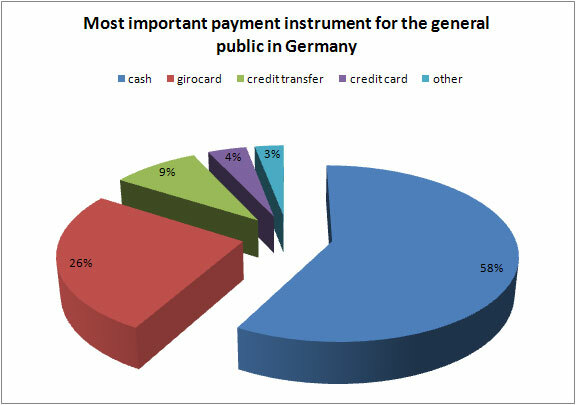 Many people think the most common payment method in Germany is by credit card and/or by direct debit (ELV = Elektronisches Lastschriftverfahren). But as I said “they just think they are” – That the credit card isn’t, you can read on the article usage of credit cards in Germany I wrote and this one will give another proof to this. I would like to start with the most common paymenth method online shop owner are used start in Germany. It’s the delivery on upfront payment, called “Vorkasse” in Germany. That this one includes a bad customer experience is abvious, because the risc loosing money is on the site of the customer (if the shop owner doesn’t deliver, despite he got the invoice paid upfront). But many smaller online shops uses this payment methods, because it’s the most secure one to start with – so would take this one as basis to start with. The following learnings are based upon the survey “Erfolgfaktor Payment” which can be also in German language at www.ecommerce-leitfaden.de with 1.131 participants. 79% of shoppers will leave your shop if you just offer prepayment. Just 21% of your customers will accept prepayment the other 79% will leave and have a look if there’s a competitor where they can pay as they want. Even if those 79% won’t find another vendor up to 56% of them still wouldn’t buy at your shop. The interesting part of this result is already 75% of online shoppers already bought at least once in the virtual world with prepayment. 25% never used this payment method. Of course eBay in Germany here is a clear driver, because mostly all bought goods there have to be paid upfront. Another interesting fact is that just 24% of the people who already used prepament online used this payment method at an online store where they have never bought before something. After a good experience the readiness to pay again upfront climbs up to 44%. If you’re lucky and your online shop has an seal of approval you can expect 41% of people who at least used once prepament in the online world would also pay upfront at you online shop. Sounds quite good but you should consider: In generall 79% of all shopper would look for another vendor, if the couldn’t find any just 23% of the would consider to buy at your shop with upfront payment and of those 23% just 24% would buy at the end of the day. This gets the figures pretty low if you think of it! 100 (100%) customers would like to buy at your shop, 79 (79%) of them would leave, because you jsut offer prepament, 23 (23%) would come back and consider to pay upfront. Of those 23 (23%) people just 6 (24%) would pay upfront at the end of the day. If you’re lucky and have a seal of approval you could convince 9 (41%) of the returners. If you add to your payment process “cash on delivery” (Zahlung per Nachnahme). The amount of cancellations drops by 11% from 79% down to 58%. The buyers who still would use prepaments drops just by 2 percentage from 21% to 19%. 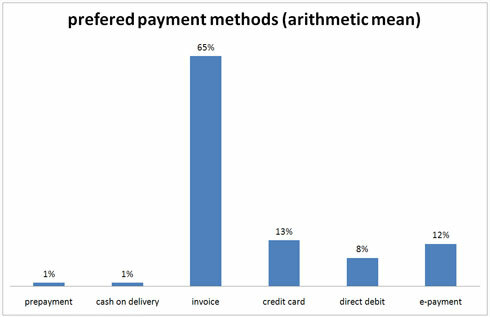 23.% of you shoppers would use the “cash on delivery” payment. But what about the payment possibitly with credit card? Let’s see if “prepament + credit card” can beat the “prepament + cash on delivery”. Yes, it can! 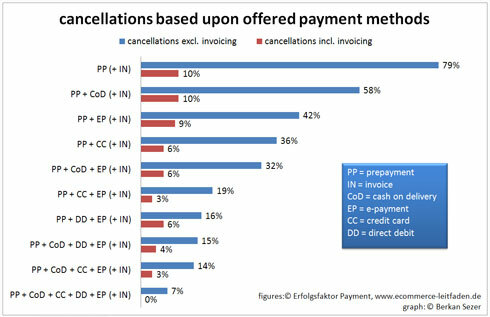 If you offer “prepayment + credit card” as payment possibilties the cancellations drops from 79% by 43% to 36%. The people so would prefer to pay by prepayment drops froms 21% by 10% down to 11%. 53% of your customers would pay via credit card, but still36% would leave your shop! 70% of the interviewed people stated that they already used at least once their credit card for online shopping. 85% of the interviewed stated that they have a credit card, which is pretty high compared to the overall coverage of credit cards in Germany which is just at 27% (see: Usage of credits cards in Germany). Adding “direct debit” to your payment method has the same effect as adding credit card payments to your online shop. The cancellations are dropping equal to the credit card from 79% by 43% to 36%. There’s just a slight shift in the beviour of the still payers vie prepament. The drop from 21% down by 13% to 8%. 55% of the shoppers would use the “direct debit” payment method. The slighty better acceptance to pay via “direct debit” may be result that the Germans are more used of this card type and think it’s more convenient than the credit card. It’s easy, it’s fast, it’s convenient but it’s still not in the heads of the target group. If you offer e-payment still 42% of your customers would cancell their order. 14% would still prefer to pay upfront and just 44% of the shoppers would prefer to pay with e-payment. Of those 44% e-payers 91% would use paypal, 29% would use ClickandBuy and 18% would use other e-payment provider such as LUUPAY, Moneybookers, T-Pay, etc. (multiple answers were possible in this question). Paypal in Germany is the most known, most trusted and therefore most used e-payment method in Germany. The easy integration in online shops makes this e-payment method an attraktive additional payment offer for online shop owners. E-payment is in a good way to become more and more important for the online business. 8% of the asked persons stated that they prefer to pay vie e-payment and this makes e-payment ranking on 4th place. But isn’t there missing our “cheery on the pie” or in this case the “cherry on our cocktail stirrer”? Watch out the next impressive results when you add following payment method to your online shop. Look at this! By just adding the additional payment method “invoice” you cancellations drops down from 79% by 69% to 10%! This makes a boost of your conversion of 429%! It’s that simple and… even though it’s that riscy! Also the readiness to pay upfront drops from 21% by 15% to 6%. So 84% of your customers would like to be invoiced. This means a bad cashflow, hughe special technical efforts due guidelines of tax authorities which have to be implemented in the shop and the ERP-system of a comapany. Small shops can handle this manually, bigger comapnies using ERP-systems should ba aware that there will be technical efforts and strictly guidelines of the tax authorities in Germany. You should also consider to work from the scratch with an debt collection agency and to provide a bilateral interface for debt collection management. If this works also for monthly subscription based business models is pretty hard to say. For sure it won’t work for small amounts of money and if the customer has to pay monthly. But if you offer instead a one year subscription with an upfront payment of the whole annual subscription rate and give you customer an incentive e.g. 1 month free on top you could get this working also for subscription based business models. And as a second cherry on top you will have a nice cashflow based upon those customers! Ok, after we having considered all different possibilities how by adding an additional payment method influence your conversion the next question is of course: Hey, could I reduce the cancellations a lot more by combining some of these payment methods and if yes what is the ideal combination of the different payment methods? I made a graph for you and so you can decide which combination of offered payment methods you want to choose, based upon your tech. ressources and your abilities to handle all those different payment methods. If you just offer prepayment at you online shop as payment method 79% of your potential customers won’t finish the payment prcedure. By adding additional payment methods you can improove your sales by 400%. Therefore invoice paing is the clear big winner in this study. Very interesting is that it doesn’t seem to make much difference if you offer credit card payment or direct debit payment. Both brings the cancellation rates down by nearly the same figures. So it’s up to you to decide which of those both you would like to offer your customers. You should just keep in mind that Germans still prefer the direct debit payment a little bit mor than paying with their credit card (if they have one, because 99% of Germans have a bank card with direct debit functions, but just 27% of Germans have a credit card). For optimize payment funnels a prefessional web controlling tools gets more and more important. Please consider that all above made statements are based upon a survey and not real online shopping behaviours. So the answers of the participants ware based that are were happy with thier shopping cart and what payment reason could influence their beviour to finish the payment process. The real figures and behaviours may of course vary but this figures could give you a quite good clue how your customers may think. It’s pretty facinating that all card payments (incl. debit cards and credit cards) in Germany made has a share of just of 7%! Regarding the EU it’s less than the half of the usage. It would be very interessting to know how the usage are in specific countries. If I find therefore some figures I will update this article asap. Ok, now normally you would think, ok the Germans need more time to get used to the credit card. But this thought is unfortunetaley wrong. If you look at the figures you can see that in Germany credit card usage grew just by 24% from 5.3% to 7.0%. Ok, this is more in growth than in EU area excl. Germany which just grew by 15%. But if you have a look at the decrease from 7.1% to 7.0% of the usage in DE from 2005 to 2006 this could be a signal of an upcoming saturation in Germany. Thus 27% of Germans own a credit card, but just 33% of them or 8% had used their card in a one-week observation period. Note: Of course we are talking here not only about online business. Those figures are for all payments made in DE, also incl. retail offline stores. Cash payment overall of Germans has a share of 58% of all expentidure. Followed far behind by the girocard (approx. 26%), credit transfers (approx. 9%) and at the unlucky end credit card fights for roundabout 4%. Can the credit card fight back in online business in Germany? For the online business I will also consider the values of mail orders, because most mail orders do offer in the meantime the possibility of online shopping – at least the big ones do. You’ve got the message? It’s unbelivable that just 7% of the online shoppers are paying with credit card. Even the most common widest spread (91% of Germans have at least one) direct debit card “girocard” in Germany is used by the Germans for online shopping! Another interesting result is that 57% of online shoppers and 68% of the mail order shoppers prefer to pay with the good old credit transfer. There are quite some reasons why Germans don’t really use their credit card much. First of all Germans are very carefully when they have to provide their data. And of course because of different fraud news in the press from big companies where personal data of customers had be stolen from hackers and other fraud issues of other big companies Germans’ see themselves confirmed not to give their personal data to online companies even if those companies are big and they have a trustable brand! Another reason could also be that Germans like to shop anonymous and also prefer to pay with cash.